An armoury belonging to the Lebanese group Hezbollah has been discovered in northern Nigeria, the West African nation's army and spy agency has said. Three Lebanese nationals have been arrested, an army spokesman, Brig Gen Ilyasu Isa Abba, said. The cache, including rifles, anti-tank weapons and an RPG, were found in a warehouse in the city of Kano, he said. Nigeria's State Security Service said they were intended for use against "Israeli and Western interests". 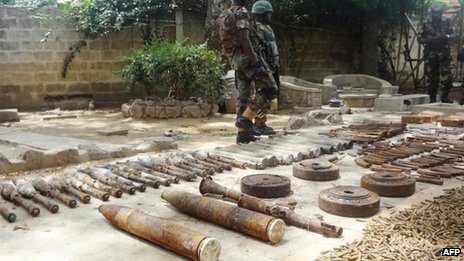 "What has just been discovered is a cell of Hezbollah and what you have seen here is a Hezbollah armoury," he told journalists in Kano on Thursday.Brig Gen Ilyasu Isa Abba said 11 anti-tank weapons, four anti-tank mines, a rocket-propelled grenade (RPG) and 21 RPG missiles, 17 AK-47s, two sub-machine guns and 76 grenades had been amongst the weapons found. There is a large business Lebanese community in Kano city, the commercial hub of northern Nigeria. It is the first time that Nigerian authorities have alleged that Hezbollah has an operational interest in the country. Kano and north-eastern Nigeria has suffered multiple attacks in the last three years since the home-grown Islamist militant group Boko Haram launched an insurgency. Mr Ettang added: "You can also be sure that if a group like this is existing then it may even lend support to some of the local terrorists we have on the ground." Hezbollah is a Shia military and political movement based in Lebanon considered by the US to be a terrorist organisation. Boko Haram, whose name means "Western education is forbidden", says its quest is to overthrow the Nigerian government and create an Islamic state. There has been growing concern that Boko Haram could be receiving backing from al-Qaeda-linked militants in other countries.